I have been hitting glutes HARD for over half a year now while following the advice of THE Glute Man - Bret Contreras. One of my favorites has quickly become the barbell hip thrust. It has taken me months to get here, and watching a video makes me notice all these form things. I am always improving. 155# for 3 sets of 10 on hip thrust in the Venus Advanced Strength glutes modules. Here is a snippet of my second set. Don't ya love my "fancy" bar pad? It is even down filled and matches my living room haha! What do you rig in your home gym? I did half of a Fibonacci pyramid of 21-13-8-5 sets for both. Funny thing is that I used to HATE chili haha! I am not sure when I changed my mind, but I did at some point! 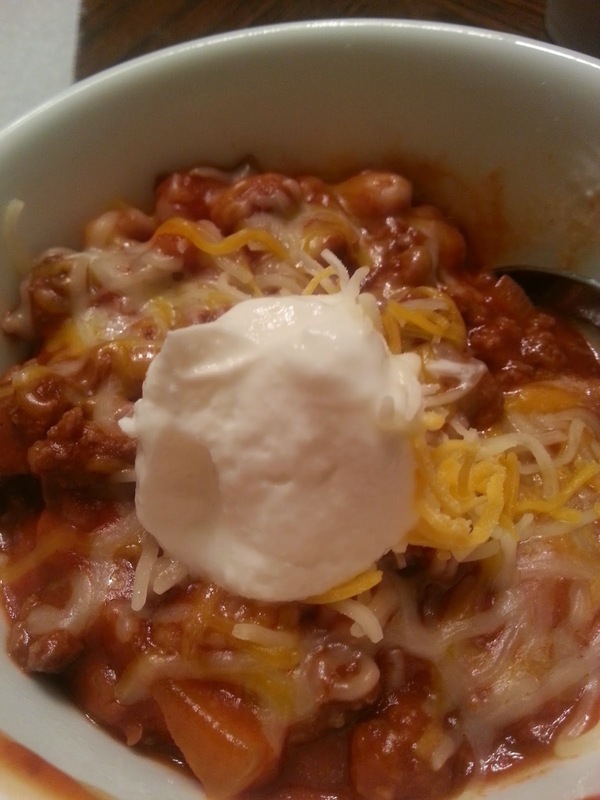 I must have changed my mind when my husband me made his chili version. Which is what I am going to share with you today. This recipe was promised HERE last week as it is part of our monthly menu when we go grocery shopping for the month. I enjoy this recipe because it is high in protein, low calorie, packed with veggies, and QUICK to make. My kids love it, and everyone can top it how they like. Brown beef and onion in large non-stick skillet. While it is cooking, add the seasonings. 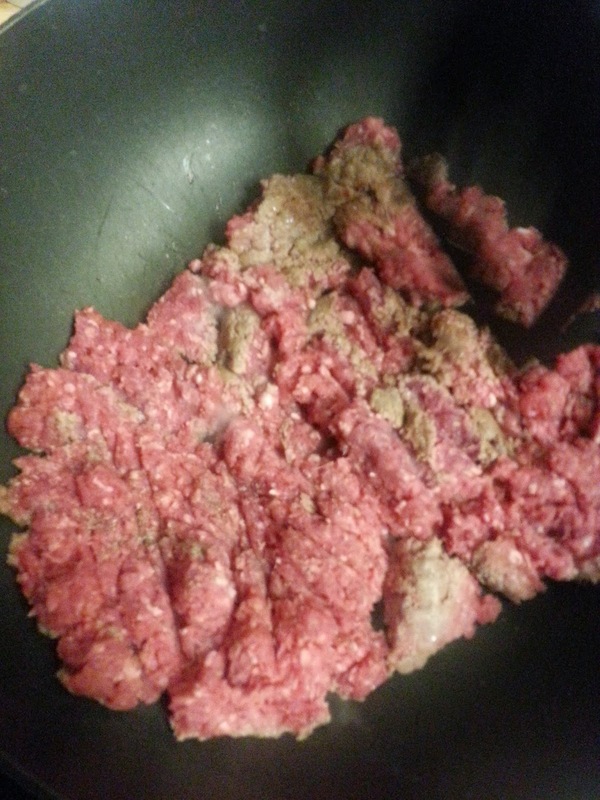 Once the beef is browned, move to side of pan and add flour. 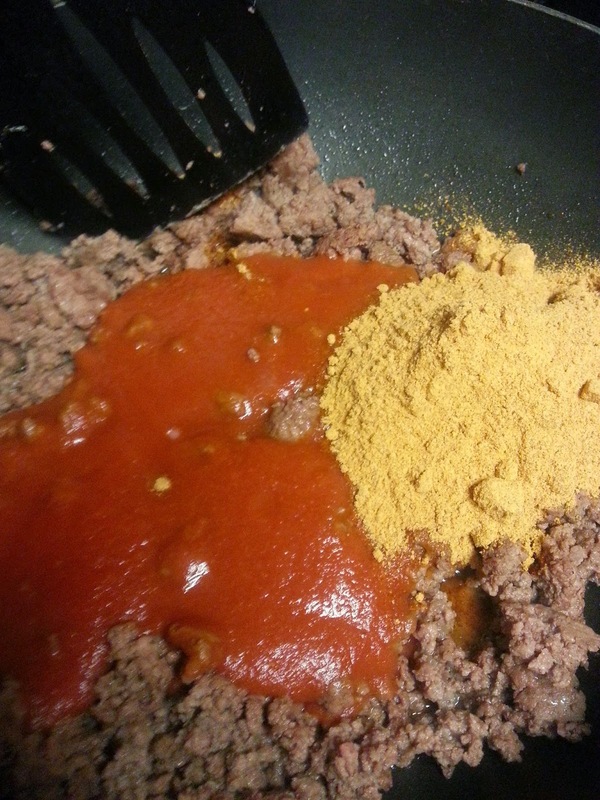 Brown until it is peanut butter in color then mix into beef mixture. 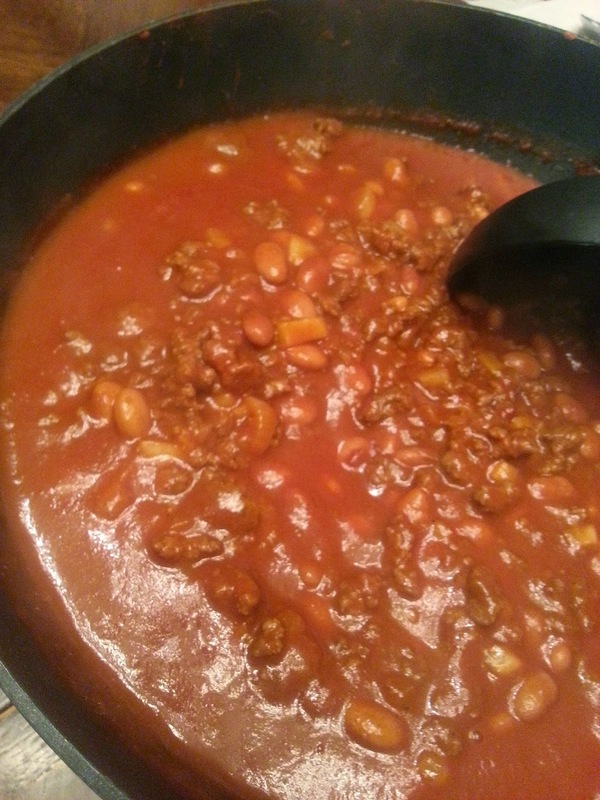 Add in tomatoes, beans, and 1 cup of water. Simmer over medium heat for 10 minutes. 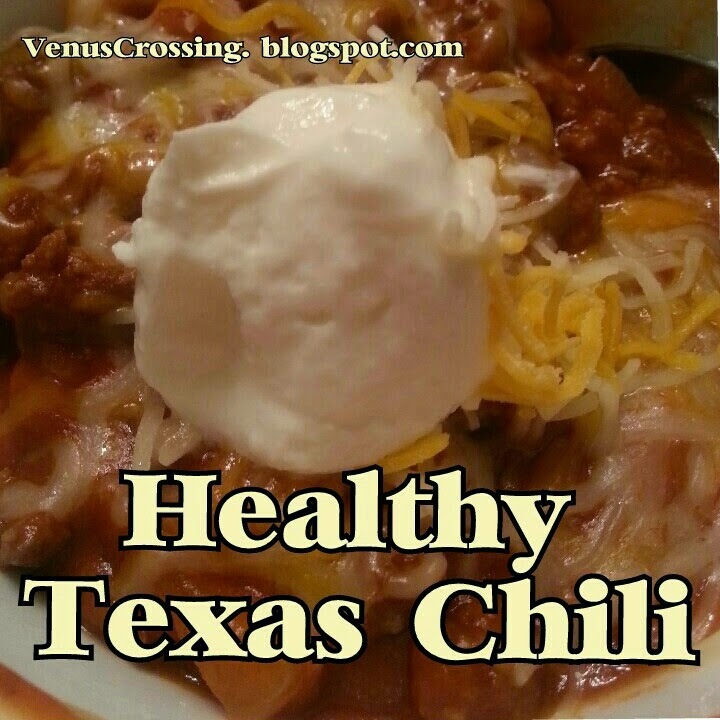 Add additional 0.5-1 cup of water depending on how you prefer the thickness of your chili. A few months ago, my husband said we should try to grocery shop for the month instead of my previous weekly shopping runs. He saw that it was taking up too much of my time and I was spending more than I should. My initial reaction was that there was no way this would work. I mean we eat a LOT of fresh produce and refrigerated food! But I decided we might as well try it, I did appreciate the idea of saving time and money along with his help for the monthly shopping run. So we are on our fourth month of this, and I wanted to share how we have made it work. I actually am getting better each month at the plan, and LOVE the time I have saved! I worked out that we need 6 dinners a week. We generally eat at a restaurant or at someone else's home at least once per week. We needed breakfasts for the month for the kids, and only a few easy lunches because we eat leftovers and at school. So 24 dinners, which really meant 12 because we can repeat them once. 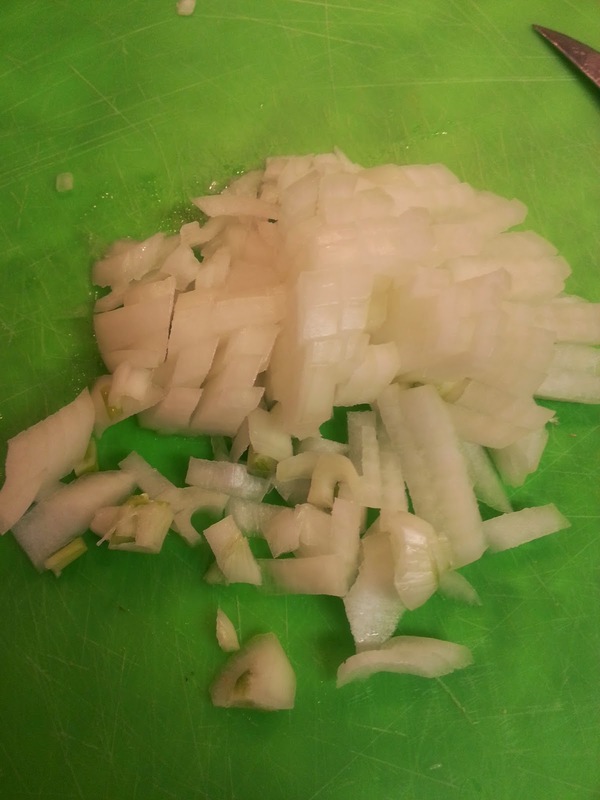 *** for the meals without a recipe hyperlink above, I will write it up in the next few weeks! And when we get tired of X or Y meal, I have just been rotating them off for something else. If you do not see a side listed, basically I plan a few veggies sides that I buy fresh like roasted squash or sauteed broccoli. I plan that for about 2 weeks worth because they will start to go bad, then I swap to frozen vegetables as the side. My kids and husband like Hawaiian dinner rolls on the side. We buy the 10 pound chubs of 90% lean ground beef. When we get home, we cut it into 1 pound portions and freeze it this way. We also buy a HUGE brisket and divide it into 2-3 portions to freeze. My husband and I eat leftovers for lunch. The kids eat at school during the week. So it is really just Saturday lunches for the kids because we eat out after church on Sundays, so we let them pick out a quick frozen favorite that I am not a fan of but is okay in moderation. They have picked Pizza Rolls or mini corn dogs out at each trip. I keep the supplies on hand for Protein Pancakes and almond butter (Recipe HERE) in case we do not have leftovers. My husband and I generally only want coffee for breakfast during the week. We pick up bacon and eggs for weekend brunches. The kids like cereal, peanut butter sandwiches, or frozen breakfast sandwiches for their breakfast during the week. We let the kids pick out enough snacks to have one each day after school- they like granola bars, fruit snacks, and apple sauce. The adults like protein bars for snacks. We buy a case of ice cream treats for dessert. I still enjoy Greek yogurt with fruit as my treat so I get a few containers for that. I buy a container of fresh fruit, but then I also buy a bag of frozen fruit. You can defrost a cup of fruit for about 1 minute and it is just right in your yogurt. I have gotten away from using the Jello pudding flavors in my yogurt like the hyperlink above, and just use a little sweetener and sometimes cocoa powder. If you have to bring things to luncheons and dinners, you still have to make random trips to the store. I try to sign up for things we happen to have though, if it is possible. We drink more wine than we thought LOL so you learn as you go. Sometimes you forget random things like trash bags on your monthly trip too. But that is all we needed to grab this past month. I am not sure if we save that much money, I think my husband realized that food is expensive! But the money that we have recouped of my time is priceless. I mean at least 6 hours a month back! I will say we buy less unplanned things which means less junk and waste. 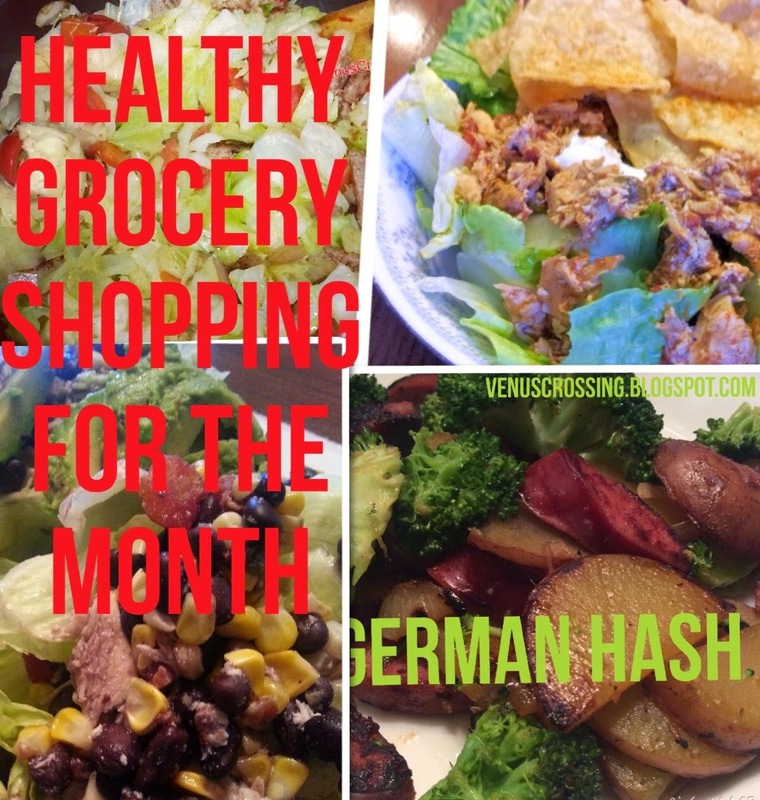 Give it a shot, monthly shopping is the bomb. One of the most difficult exercises to master in the Venus Factor System workout is the one legged get up AKA the bench pistol squat AKA the single-leg bench getup. It works your quads, hamstrings, glutes, and core. Being that it is uni-lateral, the leg being worked is under high tension so it requires loads of strength. You can even take it one level further than I have shown here with the advanced version of the one legged get up- the pistol or one legged squat. *Land as gently as possible on the bench. Then try to come right back up. *Some prefer hands on hips, some prefer hands out. See what is most comfortable. *Do not let your knee come past your toe at any point. *Do not let your knee cave inward as you move up or down. *Initiate motion from your glutes when you come up. Drive through your heel. So the higher the chair is, the easier this exercise is. Find a seat height that challenges you, but you can still complete all the reps in perfect form. 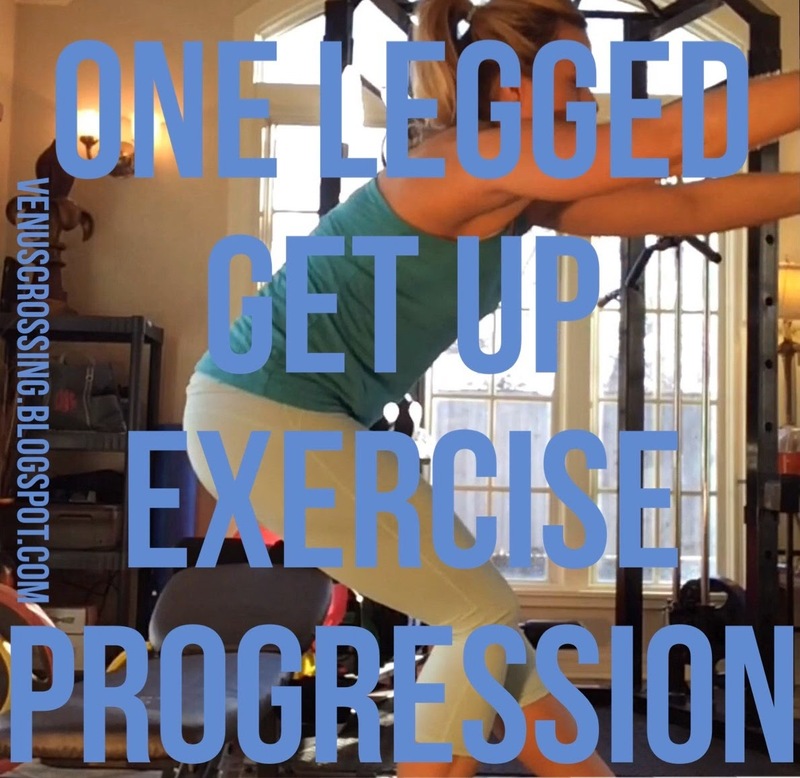 The seat should be somewhere between your thigh (easiest) and calf (hardest). A lower seat makes this more challenging. The stronger you get, the lower the seat is. Once you master right below knee level, you can start aiming for trying pistol squats!